Today’s Daily Post picked a good day to ask us to look through the window. Today looking out the window there are gray rain filled clouds in the sky. Today is going to be a windy, rainy day here in the Dallas-Fort Worth Metroplex. We definitely need the rain. Texas seems to be in a perpetual state of drought. I am always thankful for the rain when we get it. We could do without the severe weather that is headed for us now. The high winds that accompany the squaw lines have a great tendency to knock fences over. When people get home from work or school today, they will let their pets outside to run off some energy and use the restroom, as it were. Every time there is a lot of wind and likelihood of fence panels being knocked down, my Facebook page gets filled with pleas and searches for lost pets. I ask my readers to be mindful of your surroundings especially when you are home. Fences are man-made and not guaranteed. It’s a good idea to check your fences on a regular basis whether they are keeping pets, kids, or livestock in, I hate reading the pleas for lost pets as they make me sad. It happens and it’s understandable; but when you read about the extreme consequences of not checking your fences before you let your pets outside you will think twice, I hope. The K-9 went missing from his second handler, Matt Rollins, on Dec. 20, when a cold front and high winds blew a gate open. A report was filed with the Wylie Police Department when Chico was discovered missing. I am posting this article purely for the lesson learned, I cannot judge the handler or the property owner. This is an extreme consequence. I take it as, if this could happen to a deputy; it could happen to me, or anyone else, for that matter. Please check your fences, friends. 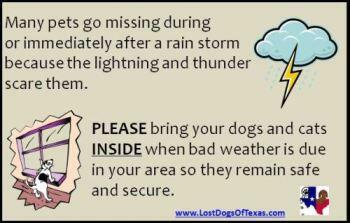 Keep your pets safe. Thank you for the reminder and earnest plea. I’ve lived in two houses where a strong wind storm right after a giant rain storm has caused our fence to blow over (both were rentals). 🙂 anytime, I really enjoy reading your articles. It’s a gray day today…that’s for sure. Thank you for the pingback. Hope your reminder will be heeded. Thank you for reading. Have a great week. Yes, fireworks can scare pets. Thanks for reading. I sense another blog post here in about 6 months or so. See, ha 🙂 I guess they need to be looked after all time then. I hope you had a fun Australia Day! I did, although the days following have been met by floods along the East Coast due to a cyclone off the coast. Oh, I am sorry to hear that. I send my prayers for the safety and well-being of everyone affected. I do not have a good way of stopping all the spam comments, I have my spam filter on high, I haven’t found a good captcha code plugin for my comment section yet. lol. So let me rdword this…. Thanks for the meal!! come back from now on. I want to encourage you to continue your great job, have a nice evening!